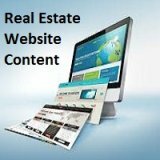 best, most focused, results oriented approaches there is in real estate marketing. It's an easy concept, and even easier to do. Let me say it again in case you didn't hear me the first time. If you can mail letters to expired listing prospects you can convert them to new listings! It’s not rocket science, but before you get too excited be forewarned that not just any old expired listing letter will do. Effective ones must have enough information on them to get the most desirable response from the expired listing prospect; a phone call or email message to you. However, if the ultimate most wanted response is a listing your letter must be outstanding. Hint! 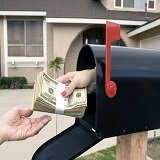 A FREE cookie cutter letter won't cut the mustard if you are competing for a $300,000.00 listing. Fortunately, there are some pretty good ones available to chose from at reasonable cost. But if you're bound and determined to write your own then have at it. There's another big upside to pre written letters; they're time tested and can be effective in any state, county, or city in the United States. Effective letters can generate a steady stream of warm, responsive expired listing prospects month after month; all interested in one thing, listing and selling their properties. It doesn't get any better than that! Some Expired Listing Systems, like the ones to your left, come with complementary letters. If you like the idea of repeat mailings go with a letter series, but if you're not interested in repeat contacts go with the single expired letter listing approach. Either way can be effective and there are pros and cons to both, but ultimately the choice comes down to your personal preference. Your expired listing prospect listing letter should at a minimum have your full name, address, and phone number(s), and other contact information. It should be as grammatically correct as possible without sounding unnatural and spell checked to be free of misspelled words. What Makes a Good Letter? A good letter should also have lots of white space. What I mean is don't have run on sentences in paragraphs seemingly without end. Instead, have short, 2-3 sentenced paragraphs. For example, every paragraph on this page, excepting this one, is 3 sentences or less. Also, use bullets whenever possible to break your sales message to help your reader better comprehend it. Let's face it - real estate agents need listings. The more you have the more money you'll make. On the other hand you severely inhibit your earning capacity if you don't have many listings. 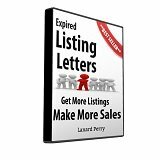 A good expired listing system, with expired listing prospect letters can help you get listings – period! They can help new agents get off to good starts and offer new beginnings for veteran agents who have been around for awhile. If you can conceive it you can achieve it! So, imagine listing signs with your name on them dotted throughout your community. They will give you instant credibility and help you generate more listings and make more sales. Everybody likes doing business with a winner and a good expired letter listing campaign can help make you one.